Here’s a nature project for your home that is so adaptable, any family can do it. It yields acres worth of benefits, too, for whatever fraction of acreage you’ve got: you’ll be preserving native wildlife habitat, staving off the dreaded Nature Deficit Disorder and logging meaningful family time. And you can call the whole thing Jewish! The project can be short term or long, with no previous experience required. All you need a bit of yard — or even just a balcony — and some basic principles. Let’s start with principles. Item: wildlife has a tough time, what with worldwide destruction of habitat, pesticide use and a zillion other challenges. Item: kids are screen-time-heavy and could stand to clock more hours outside. Item: children can learn loads by watching and helping wildlife, including feeding birds and watching butterflies, chipmunks, lizards, ants and whatever critter happens to be around. It’s simple to translate these items from the world at large to your world at home. You can make your own yard or patio, however small, into a haven for wildlife. And kids, however young, can help. How? Here’s where a ready-made, customizable scheme comes in. You can wing it yourself, sure, but The National Wildlife Federation has this stuff down. Their Certified Backyard Wildlife Habitat program spells out what wildlife needs — at home, school, a synagogue, anywhere — and how to provide it. Creatures need four basic things: food, water, cover and a place to raise babies. 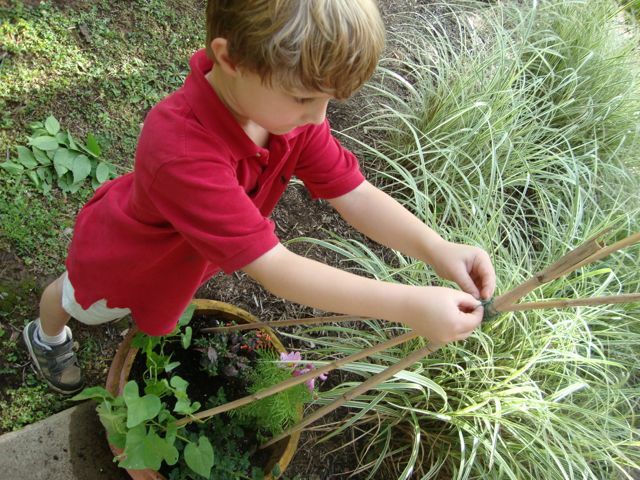 An easy, online site survey reveals elements present or missing in your yard, and it’ll be fun for your kids to add their own ideas to the survey towards qualifying for certification. Options can be simple or elaborate, and you may already have more assets than you realize: a few shrubs, trees and flowers, depending on species and sizes, might provide ample food, cover and nesting sites. Or you can bag all four requirements with a bird feeder, a dish of water and, for both cover and nesting, a birdhouse. This is where that customizable bit comes in. You work with what you have, and what you don’t have, you make. Together, preferably. Certification doesn’t mean you have to spend your whole summer on this thing or a lot of cash. We did our house in day, and all I had to buy was a pole for my preschooler’s handmade bluebird box. The results, however, last far longer than a day. What does certification mean? It means a donation of $20 to the National Wildlife Federation, who will officially recognize your space as a help, not a hindrance, to wildlife. They’ll mail your kid a personalized certificate, and you can even buy a spiffy sign for the yard. What you really get is the chance to work with your child as nature detectives, explore the yard on a Habitat Hunt, learn about which creatures live there, what they might need and how to give it to them. And, if you wish, you frame the whole thing with a mitzvah. Taking care of animals is a universal action of compassion and good sense. It’s also very Jewish. The big mitzvah that springs to mind is tzaar baalei hayim or the ethical treatment of living creatures. It’s a commandment, a rule, an order. The Torah describes it, the Talmud names it. If you mention this phrase to your child — in English or Hebrew — as a mitzvah we perform, you frame the whole nature project as a Jewish act, as you will, by extension, every subsequent feeder refilled, birdbath rinsed and flower planted. All this goodness — designated Jewy or not — helps children feel a happy sense of responsibility for the natural world, their world, and be active participants in its preservation. Full disclosure: I am not affiliated with the National Wildlife Federation, but I did just lead a preschool through certification as well as my own little yard. You can read about that here. Joanna Brichetto is not a balabusta (Yiddish for female boss of the home), but she plays one on the Internet. 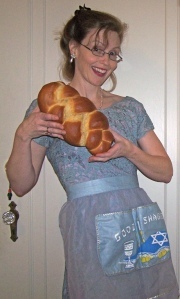 Her website, Bible Belt Balabusta, offers up hands-on, Jewy projects for kids, parents and teachers.